This upbeat album is perfect for kids with food allergies. 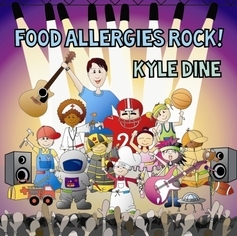 Kyle Dine makes food allergies fun and engaging with his songs that empower and support kids with food allergies. Get your feet stomping and your hands clapping for these amazing sing-along songs! This upbeat kids food allergy CD album is perfect for kids with food allergies.